Who builds the fastest exotic car? Ferrari? Bugatti? Zonda? How about, North Carolina. It’s the home of . A small company of only 9 employees, started by brothers KC and Kevin Howeth. They grew up in a family of stock car racers and dragsters, but thankfully they realized it’s more fun to drive a turbo exotic than to turn left. They opened a shop a few years ago and were soon building the fastest Vipers in the country. But the Howeth’s hit their stride when someone brought them a Lamborghini Gallardo and asked them do what they could. Their bays have been filled with Italian bulls ever since, with turbochargers and intercooler piping lining the shelves, waiting for new homes. In particular, they built one very special, very very fast Gallardo. In fact, the Underground Racing Lamborghini Gallardo is the fastest Lambo in the world. Watch the video after the jump. This is no “big fish story”, it is a fact. In October of 2009, at the , Kyle Bennet’s Gallardo broke the record for a Lamborghini in a standing mile. The Texas Mile is an event where people take cars and motorcycles of every shape, size, build and cost and see how fast they go, from a stand-still, in one mile. Kyle went 241.7mph. It took James May 5.5 miles to take a Veyron up to 253mph. I think if Kyle had had that much room he’d be going so fast he’d bend time. Big speed requires big power, and this Gallardo has as much as an exploding planet; 1500WHP to be exact. That’s as much power as The Hulk has after you kick him in the grapes. To extract this completely insane level of thrust, UR re-built the engine. From bolts, to blue-printing, to rods and heads, nothing went untouched. A sizeable pair of 62mm turbos was installed, and the tank was filled with C-16 racing gas. I’ll skip the play-by-play and let the video do the talking. Lately small shops in the southern US have been at the forefront of exotic car-tuning. It’s interesting two of the best, Heffner Performance and Underground Racing, both have backgrounds in Mustang tuning and both have made their name putting big snails (and big power) in Lamborghinis. This must be what happens when people with the heart of a muscle car dragster decide to work on exotics. And Underground Racing isn’t finished yet. They plan to go back to the Texas Mile in March with a goal of 250+mph. Who knew Italians would get along so well with Southerners? 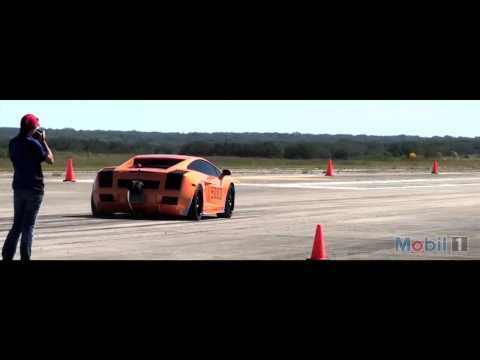 Kyle Bennet’s World Record-Holding Lamborghini Gallardo at The Texas Mile. Video: Snow Drifting a Rolls-Royce - Hilarious or Sacrilegious?